I don’t think anyone knows who started this unique holiday, and while it’s not as popular today as it was a few decades ago, Christmas holiday caroling is still a great opportunity to get friends and neighbors together to enjoy the holiday and appreciate the meaning of the season. Many groups, such as Scouts and youth groups often partake in this special musical event. 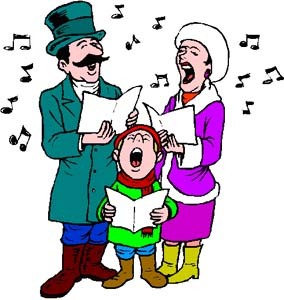 Even family parties and business parties sometimes produce an impromptu caroling event. Caroling remains an important part of our cultural and social society. I remember when my boys were younger and in cub/boy scouts, we would frequently go caroling to nursing homes and senior citizen centers. (Don’t forget to call ahead to the facility management to arrange a date and time!) And the bonus ~ a caroling event is often topped off with hot chocolate and cookies. So I challenge you: buck the declining trend and organize a sing along ~ at home ~ at the office ~ out at lunch even! It may take a little planning to make your Christmas caroling happen, but in this day and age, you can get everything delivered to your front door, even a song!